This exterior door is a three panel design with two vertical panels atop a third horizontal panel. Each panel is finished by molding. The door's muntin is adorned with an antique bronze door knocker in the shape of dolphin, whose nose is pointing toward a peep hole. The door's lock rail is fitted with a matching antique bronze mail slot. Additional door hardware includes a brass lock and several other items of antique bronze door furniture on the door's stile. The hinges are not visible, and the doorway offers no additional decoration or adornment as the stoop is very narrow, barely more than the width of the door. 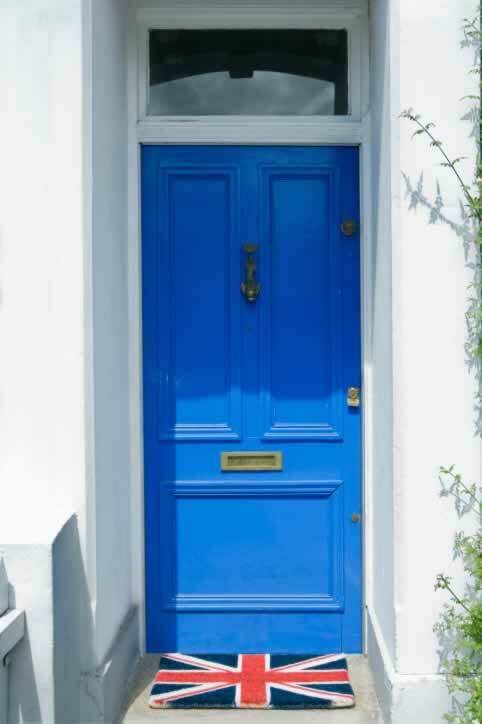 The door is constructed of wood and finished in vibrant, blue semi-gloss enamel. Above the door, a single pane of glass (a lite) the width of the door provides light to the interior entry. The Union Jack door mat adds an inviting splash of color.